The incidence of PHVT is high in developing countries and it contributes significantly to the late morbidity and mortality after heart valve surgery. Guidelines are divided over the best line of therapy with some (European Society of Cardiology) recommending surgery for all, irrespective of clinical status, while others (society of heart valve diseases) recommend thrombolytic therapy for all patients without contraindications. None of the guidelines have any Class I recommendation for management of heart valve thrombosis due to lack of randomized controlled trials (RCT). In India and other developing countries, thrombolytic therapy is an attractive option due to high cost and unavailability of surgery on emergency basis in many centers. Mortality of surgery is also considerably high varying from 5% in the New York Heart Association (NYHA) Class II with up to 50% in NYHA Class IV patients. Recent studies have shed light over various new low-dose, slow infusion regimens of thrombolytic agents which are associated with equivalent efficacy as older regimens but are safer. In this article, we review the newer regimens of thrombolytic agents. PHVT is more common in mechanical heart valves than bioprosthetic heart valves. It occurs more frequently in the tricuspid than mitral position. Aortic position has a much lesser incidence than the mitral and tricuspid valves. Bileaflet valves have a lower incidence than the unileaflet and ball and cage mechanical prosthesis. Suboptimal anticoagulation is the major reason for PHVT in almost all case series. Atrial fibrillation (AF) is a well-recognized risk factor for PHVT. Severe LV dysfunction is also emerging as a risk factor in many studies. PHVT usually occurs in patients on suboptimal anticoagulation. It is suspected when a patient with prosthetic heart valve presents with dyspnea on exertion, chest pain, or embolic events. Symptom duration is usually shorter than 2 weeks in the majority of patients. It can present acutely as cardiogenic shock or heart failure. On examination, one may find loss of prosthetic click, appearance of new murmurs, or evidence of heart failure. In high volume centers, cinefluroscopy is a quick and good screening test as it can diagnose obstructive as well as nonobstructive valve thrombosis in form of decreased leaflet motion. To visualize the aortic valve in profile, left anterior oblique view is used while mitral valve is visualized best in right anterior oblique view. In the opposite oblique view, base ring is positioned to yield an en face view. There is no single technique for attaining an orientation due to surgeons' individual variation in prosthesis orientation. In some centers, transthoracic echocardiography (TTE) is preferred or the only modality available for diagnosis. PHVT may be suspected if the Doppler-derived gradients are twice as high as empirically found in normal prostheses. For mitral prostheses, a mean gradient >6 mmHg and an effective area <1.3 cm 2 is suggestive of PHVT and >8 mmHg is indicative of PHVT. For aortic prostheses, mean gradient above 30 mmHg is abnormal and indicated further investigation for PHVT. Mean gradient >45 mmHg in absent of other causes is considered as the criteria for PHVT. Cine fluoroscopy (CF) and TTE are quick, effective, and complementary diagnostic tools to diagnose PHVT in most patients. Once the diagnosis is strongly considered on the basis of TTE or cinefluroscopy, transesophageal echocardiography (TEE) helps further in confirming the diagnosis and differentiating pannus versus thrombus. TEE also plays a role in planning the management by calculating thrombus area and has been incorporated in guidelines. However, TEE being an invasive investigation, it is sometimes practically difficult to perform in a Class IV or critically ill patient who is not on mechanical ventilation. TTE is then useful in calculation of gradients and response to thrombolytic therapy. In recent series, TEE was used to assess the response to thrombolytic therapy as it can accurately measure the thrombus area and guide in therapy. Diagnosis is often confirmed by CF or echocardiography. Although TTE is used for calculation of gradient and response to thrombolytic therapy, definitive diagnosis is greatly aided by TEE, particularly three-dimensional echocardiography. TEE can differentiate between pannus and thrombus unlike CF. Calculation of thrombus area by TEE has been shown to be predictor of embolic complications and this has now been incorporated in guidelines. CF is an inexpensive tool available in all centers unlike TEE and hence forms the main tool for diagnosis of PHVT in many centers in developing countries. It may show partial or complete restriction of leaflet movement. 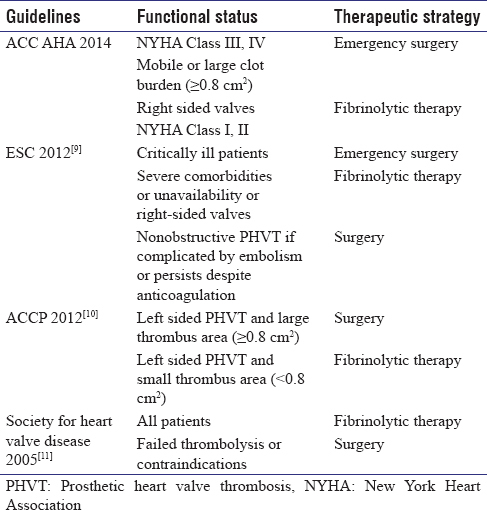 The guidelines for the management of prosthetic valve thrombosis state [Table 1]. Emergency surgery is recommended for a thrombosed left-sided prosthetic heart valve with Class III–IV symptoms. Surgery is also recommended with a large thrombus (>0.8 cm 2). The American College of Cardiology/American Heart Association guidelines further state that in NYHA Class I and II patients, it is worthwhile to switch to heparin therapy for few days and to assess the response. Although the evidence base is limited, it is a useful option as the risk of adverse events can be minimized by this approach. Trials are mostly retrospective or prospective in this population apart from very few RCT [Table 2] and [Table 3]. 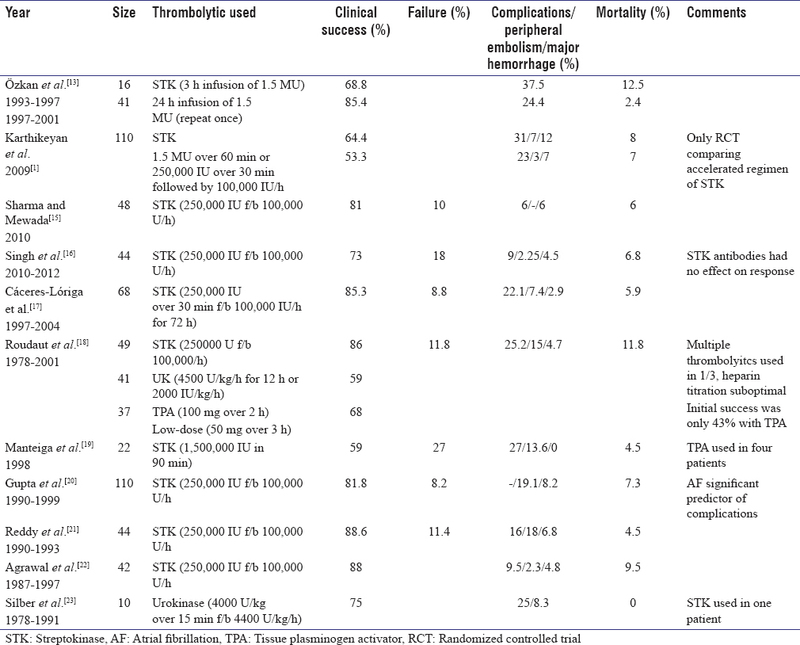 There is also no trial comparing different thrombolytic regimens head to head other than a single RCT in India which compared accelerated infusion of streptokinase (STK) with traditional dosage of STK. Urokinase has lower success rates and hence rarely used these days. Contrary to the traditional thinking, evidence is emerging that most of the bleeding complications occur early during thrombolytic infusion. Although the largest experience is with STK, recent trials on low-dose tissue plasminogen activator (TPA) have shown remarkably low incidence of embolic and hemorrhagic complications due to slow lysis of thrombus and more fibrin selective than STK. 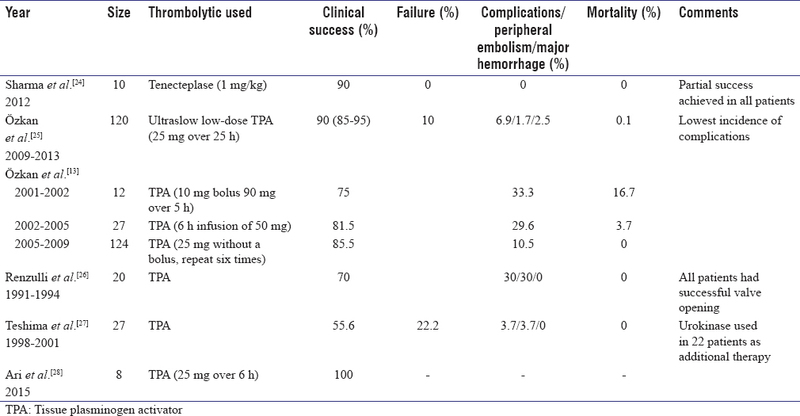 Case reports of successful thrombolysis with tenecteplase and reteplase have been published. TROIA trial was the largest cohort study of thrombolysis for PHVT published. It was a single center study where thrombolytic regimens were constantly reevaluated for complications and success rates periodically. TROIA used overall five regimens – rapid STK, slow STK, rapid full-dose TPA, slow half-dose TPA, and very low-dose slow TPA… success of lysis was almost equal in all regimens while complication were least in very low-dose TPA. It was completely TEE-guided thrombolysis and was a nonrandomized study and high thrombus burden cases were likely to be sent for surgery. Repeat doses of thrombolytic were given in event of failure or partial success. The authors found that low-dose TPA (25 mg over 6 h) was found to have the lowest complication rates. Interestingly no mortality occurred in low-dose TPA despite having an adequate sample size of 120 episodes. Predictors of complications by multivariate analysis were any thrombolytic regimen other than low-dose TPA and a history of transient ischemic attack or stroke. Complication rates were least in the low-dose TPA group (10.5%) which is much lower than the previously reported complication rates in major cohort studies with STK. The final success rate was comparable in all five groups – the time in which there was good response was different – with high-dose and classical regimen resulted in faster opening of valve and resolution of obstruction,… this could be crucial while thrombolysing critically ill patient where early resolution of obstruction could be lifesaving. In this study, the sick population was not randomized so critical patients may have been sent for surgery and therefore while applying the results, it is important to remember that in a setting where thrombolysis is the primary mode of treatment, very low slow infusion may not be prudent for a sick high-risk group. Since the publication of first case report of low-dose ultraslow TPA, this regimen has been evaluated in a larger trial and has shown promising results in the Ultraslow PROMETEE trial. This trial was a prospective observational single center study, and they analyzed 114 patients with 120 episodes of PHVT who were thrombolysed with low-dose TPA 25 mg which was given over 25 h. Eight sessions were given in case of failure after session with heparin overlap for 6 h between consecutive sessions. Results were notable with remarkable success rates of 90% (85–95%). Mean dose of TPA required was 64 ± 48 mg. Recurrence occurred in six patients (6.3%). Significant predictors of thrombolytic failure were higher NYHA class at presentation, AF, and duration of suboptimal anticoagulation, valve area, and thrombus area. On multivariate analysis, only higher NYHA class was the significant predictor. Complications occurred mainly during the initial sessions and there were four nonfatal major complications. Only one patient died due to refractory heart failure. Predictors of complications were higher NYHA class, AF, duration of suboptimal anticoagulation, and higher thrombus area. Major limitation of the study was that NYHA Class IV patients were underrepresented and these patients did not have a good outcome. All recent trials of newer fibrin-specific thrombolytics have shown encouraging results in success rates and fewer embolic events, major hemorrhages, and thus mortality. Success rates vary widely between 60% and 90%. Success rates defined in earlier studies did include patients with complications also unlike in recent studies. It is clear from studies that low-dose TPA and ultraslow low-dose TPA have minor embolic complications due to slow lysis and lower bleeding complications than STK infusion. However, for NYHA IV patients, immediate surgery or thrombolysis is needed, hence accelerated regimens would be the better choice though low-dose TPA has been successful in TROIA trial. There is no RCT comparing thrombolysis to surgery in PHVT. Most of the data are obtained from observational studies. A meta-analysis conducted by Karthikeyan et al. which compared studies comparing surgery to thrombolysis found that surgery resulted in complete success more than thrombolysis though the difference was not statistically significant. Mortality was not significantly different between the two groups though numerically it was more in the surgery group. Complications such as systemic embolism, major bleeding, and rethrombosis all occurred significantly less in the surgery arm. Thus, they concluded that surgery is better than thrombolysis. Castilho et al. conducted a meta-analysis which included all studies comparing thrombolysis and surgery found that mortality was significantly lower in thrombolysis arm than surgery arm (6.6% vs. 18.1%). They also showed that surgical mortality was lower in the two-arm studies in centers where both procedures are done at the discretion of the physician unlike in the one arm centers where surgery is the preferred treatment modality (12.6% vs. 20.6%). Similarly, thrombolysis mortality was significantly lower in the single-arm group where thrombolysis is the preferred treatment modality for all patients (6.1% vs. 10.8%). The rate of embolic events was higher in the thrombolysis arm though the rates of stroke were similar in both the arms. Intracranial hemorrhage occurred only in the thrombolytic arm. Thus, a RCT only will provide the definite answer to whether thrombolysis or surgery is better. Two such RCTs are already ongoing. Approach could be to individualize the treatment depending on NYHA class, thrombus burden, and availability of surgery. Newer regimen of very low-dose, slow infusion leads to equal efficacy with lower complication in majority of patients. However, the response time is longer and TEE guidance is mandatory during the treatment. NYHA Class I-II who have low thrombus burden should receive thrombolysis with low-dose, slow infusion while those with high thrombus burden should be planned for surgery as risk of surgery is likely to be lower (5–10%) versus risk of complication of thrombolysis (15–20%). In patients presenting with NYHA Class III, decision is to be individualized based on thrombus burden. Patients presenting with NYHA Class IV and cardiogenic shock/heart failure to be treated with classical dose thrombolysis as time is of essence here and surgical mortality is very high (>50%). Karthikeyan G, Math RS, Mathew N, Shankar B, Kalaivani M, Singh S, et al. Accelerated infusion of streptokinase for the treatment of left-sided prosthetic valve thrombosis: A randomized controlled trial. Circulation 2009;120:1108-14. Luluaga IT, Carrera D, D'Oliveira J, Cantaluppi CG, Santin H, Molteni L, et al. Successful thrombolytic therapy after acute tricuspid-valve obstruction. Lancet 1971;1:1067-8. Zoghbi WA, Chambers JB, Dumesnil JG, Foster E, Gottdiener JS, Grayburn PA, et al. Recommendations for evaluation of prosthetic valves with echocardiography and Doppler ultrasound: A report from the American Society of Echocardiography's Guidelines and Standards Committee and the Task Force on Prosthetic Valves, developed in conjunction with the American College of Cardiology Cardiovascular Imaging Committee, Cardiac Imaging Committee of the American Heart Association, the European Association of Echocardiography, a registered branch of the European Society of Cardiology, the Japanese Society of Echocardiography and the Canadian Society of Echocardiography, endorsed by the American College of Cardiology Foundation, American Heart Association, European Association of Echocardiography, a registered branch of the European Society of Cardiology, the Japanese Society of Echocardiography, and Canadian Society of Echocardiography. J Am Soc Echocardiogr 2009;22:975-1014. Tong AT, Roudaut R, Ozkan M, Sagie A, Shahid MS, Pontes Júnior SC, et al. Transesophageal echocardiography improves risk assessment of thrombolysis of prosthetic valve thrombosis: Results of the international PRO-TEE registry. J Am Coll Cardiol 2004;43:77-84. Ueda T, Teshima H, Fukunaga S, Aoyagi S, Tanaka H. Evaluation of prosthetic valve obstruction on electrocardiographically gated multidetector-row computed tomography – Identification of subprosthetic pannus in the aortic position. Circ J 2013;77:418-23. Tanis W, Habets J, van den Brink RB, Symersky P, Budde RP, Chamuleau SA. Differentiation of thrombus from pannus as the cause of acquired mechanical prosthetic heart valve obstruction by non-invasive imaging: A review of the literature. Eur Heart J Cardiovasc Imaging 2014;15:119-29. Nishimura RA, Otto CM, Bonow RO, Carabello BA, Erwin JP 3rd, Guyton RA, et al. 2014 AHA/ACC guideline for the management of patients with valvular heart disease: A report of the American College of Cardiology/American Heart Association Task Force on Practice Guidelines. J Am Coll Cardiol 2014;63:e57-185. Joint Task Force on the Management of Valvular Heart Disease of the European Society of Cardiology (ESC); European Association for Cardio-Thoracic Surgery (EACTS), Vahanian A, Alfieri O, Andreotti F, Antunes MJ, Barón-Esquivias G, et al. Guidelines on the management of valvular heart disease (version 2012). Eur Heart J 2012;33:2451-96. Whitlock RP, Sun JC, Fremes SE, Rubens FD, Teoh KH; American College of Chest Physicians. Antithrombotic and thrombolytic therapy for valvular disease: Antithrombotic therapy and prevention of thrombosis, 9th ed: American College of Chest Physicians evidence-based clinical practice guidelines. Chest 2012;141 2 Suppl: e576S-600S. Lengyel M, Horstkotte D, Völler H, Mistiaen WP; Working Group Infection, Thrombosis, Embolism and Bleeding of the Society for Heart Valve Disease. Recommendations for the management of prosthetic valve thrombosis. J Heart Valve Dis 2005;14:567-75. Karthikeyan G, Mathew N, Math RS, Devasenapathy N, Kothari SS, Bahl VK. Timing of adverse events during fibrinolytic therapy with streptokinase for left-sided prosthetic valve thrombosis. J Thromb Thrombolysis 2011;32:146-9. Özkan M, Gündüz S, Biteker M, Astarcioglu MA, Çevik C, Kaynak E, et al. Comparison of different TEE-guided thrombolytic regimens for prosthetic valve thrombosis: The TROIA trial. JACC Cardiovasc Imaging 2013;6:206-16. Nguyen PK, Wasserman SM, Fann JI, Giacomini J. Successful lysis of an aortic prosthetic valve thrombosis with a dosing regimen for peripheral artery and bypass graft occlusions. J Thorac Cardiovasc Surg 2008;135:691-3. Sharma KH, Mewada NM. Efficacy and safety of streptokinase in prosthetic valve thrombosis (total 5 years clinical registry). Indian J Pharmacol 2010;42:330-1. Singh S, Doshi S, Salahuddin S, Tarik M, Barwad P, Ramakrishnan L, et al. Antistreptokinase antibodies and outcome of fibrinolytic therapy with streptokinase for left-sided prosthetic valve thrombosis. Am Heart J 2015;169:170-4. Cáceres-Lóriga FM, Pérez-López H, Morlans-Hernández K, Facundo-Sánchez H, Santos-Gracia J, Valiente-Mustelier J, et al. Thrombolysis as first choice therapy in prosthetic heart valve thrombosis. A study of 68 patients. J Thromb Thrombolysis 2006;21:185-90. Roudaut R, Lafitte S, Roudaut MF, Courtault C, Perron JM, Jaïs C, et al. Fibrinolysis of mechanical prosthetic valve thrombosis: A single-center study of 127 cases. J Am Coll Cardiol 2003;41:653-8. Manteiga R, Carlos Souto J, Altès A, Mateo J, Arís A, Dominguez JM, et al. Short-course thrombolysis as the first line of therapy for cardiac valve thrombosis. J Thorac Cardiovasc Surg 1998;115:780-4. Gupta D, Kothari SS, Bahl VK, Goswami KC, Talwar KK, Manchanda SC, et al. Thrombolytic therapy for prosthetic valve thrombosis: Short- and long-term results. Am Heart J 2000;140:906-16. Reddy NK, Padmanabhan TN, Singh S, Kumar DN, Raju PR, Satyanarayana PV, et al. Thrombolysis in left-sided prosthetic valve occlusion: Immediate and follow-up results. Ann Thorac Surg 1994;58:462-70. Agrawal D, Dubey S, Saket B, Bhargava M, Mehta N, Lohchab SS, et al. Thrombolytic therapy for prosthetic valve thrombosis in Third World countries. Indian Heart J 1997;49:383-6. Silber H, Khan SS, Matloff JM, Chaux A, DeRobertis M, Gray R. The St. Jude valve. Thrombolysis as the first line of therapy for cardiac valve thrombosis. Circulation 1993;87:30-7. Sharma V, Singh R, Mishra R, Arora AP, Gupta LC, Yadava OP. Use of tenecteplase for left-sided prosthetic valve thrombosis. J Assoc Physicians India 2012;60:55-8. Özkan M, Gündüz S, Gürsoy OM, Karakoyun S, Astarcioglu MA, Kalçik M, et al. Ultraslow thrombolytic therapy: A novel strategy in the management of PROsthetic MEchanical valve thrombosis and the prEdictors of outcomE: The ultra-slow PROMETEE trial. Am Heart J 2015;170:409-18. Renzulli A, Vitale N, Caruso A, Dialetto G, de Luca L, Schinosa T, et al. Thrombolysis for prosthetic valve thrombosis: Indications and results. J Heart Valve Dis 1997;6:212-8. Teshima H, Hayashida N, Nishimi M, Tayama E, Fukunaga S, Tomoeda H, et al. Thrombolytic therapy with tissue plasminogen activator for the treatment of nonstructural malfunction of bileaflet cardiac valve prostheses. Artif Organs 2002;26:460-6. Ari H, Dogan A, Ceviker K, Aksoy F, Arslan A, Varol E. A Case series of obstructive prosthetic mitral valve thrombosis, successfully treated with low-dose, slow infusion tissue-type plasminogen activator. J Heart Valve Dis 2015;24:353-9. Karthikeyan G, Senguttuvan NB, Joseph J, Devasenapathy N, Bahl VK, Airan B. Urgent surgery compared with fibrinolytic therapy for the treatment of left-sided prosthetic heart valve thrombosis: A systematic review and meta-analysis of observational studies. Eur Heart J 2013;34:1557-66. Castilho FM, De Sousa MR, Mendonça AL, Ribeiro AL, Cáceres-Lóriga FM. Thrombolytic therapy or surgery for valve prosthesis thrombosis: Systematic review and meta-analysis. Thromb Haemost 2014;12:1218-28.